We’d love your help. Let us know what’s wrong with this preview of The Battles that Changed History by Fletcher Pratt. Time and again, the course of Western civilization has been forever changed by the outcome of a clash of arms. 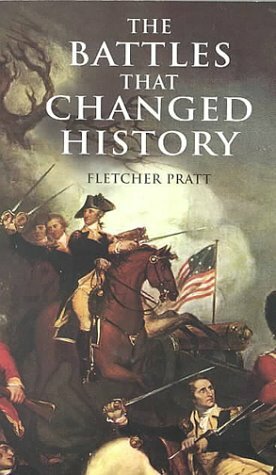 In this thought-provoking volume, the eminent author and historian Fletcher Pratt profiles 16 decisive struggles from ancient and modern times, ranging from Alexander the Great’s defeat of the Persians at the Battle of Arbela to World War II’s Battle of Midway, in Time and again, the course of Western civilization has been forever changed by the outcome of a clash of arms. In this thought-provoking volume, the eminent author and historian Fletcher Pratt profiles 16 decisive struggles from ancient and modern times, ranging from Alexander the Great’s defeat of the Persians at the Battle of Arbela to World War II’s Battle of Midway, in which U.S. forces halted the Japanese advance. Each of these conflicts, despite considerable variations in locale and warfare techniques, represents a pivotal situation — a scenario in which a different outcome would have resulted in a radically changed world. On history’s broad canvas, Pratt paints dramatic portraits of battles fought by Roman legions, French archers, American rebels, and myriad other soldiers and sailors. In addition to gripping accounts of the actual battles, the author describes the full panorama of events leading up to the decisive clashes, as well as their historically important aftermath. Readers will also find fascinating facts and anecdotes about a dazzling cast of personalities associated with these epochal struggles, including Joan of Arc, Frederick the Great, Lord Nelson, Ulysses S. Grant, and many more. To ask other readers questions about The Battles that Changed History, please sign up. This book covered the history of Western Civilization through focusing on the pivotal wars and battles. I don't know when it began happening to me, but as I grow older, I appreciate history more and more. Events and people from the past mean more to me every year as I see their echoes in the modern world. I don't think I could have fully appreciated this book until this decade of my life, but now it left me wanting to study many of these time periods in more detail. The strength of this book is t This book covered the history of Western Civilization through focusing on the pivotal wars and battles. I don't know when it began happening to me, but as I grow older, I appreciate history more and more. Events and people from the past mean more to me every year as I see their echoes in the modern world. I don't think I could have fully appreciated this book until this decade of my life, but now it left me wanting to study many of these time periods in more detail. A vast range of warfare was well covered by this author - from war elephants to aircraft carriers. Each battle was well introduced with lots of context and then a detailed account given of the movement of units, followed by why it was decisive in history. This author seems to be a (1956) scholar and writes as such, not easy flowing like a David McCullough. I wonder if any post-WWII battles would have made his list. This is really filling in the blanks for me in terms of political and military history in the period between the Middle Ages and the Enlightenment. It's also reviving my interest in strategy and tactics. This book is a good introduction to military history. My main complaint is that the book needed more maps to help the reader visualize the battles. If you read this book, have the internet handy to pull up additional maps as needed. Nice pace and nice touches of prose. A good primer on world history as history was changed by these battles. I usually don't like war-centric histories, but this book makes a really good argument about how the battles highlighted in this book really did change the course of history. Murray Fletcher Pratt (1897–1956) was a science fiction and fantasy writer; he was also well-known as a writer on naval history and on the American Civil War. Pratt attended Hobart College for one year. During the 1920s he worked for the Buffalo Courier-Express and on a Staten Island newspaper. In the late 1920s he began selling stories to pulp magazines. When a fire gutted his apartment in the 193 Murray Fletcher Pratt (1897–1956) was a science fiction and fantasy writer; he was also well-known as a writer on naval history and on the American Civil War. Pratt attended Hobart College for one year. During the 1920s he worked for the Buffalo Courier-Express and on a Staten Island newspaper. In the late 1920s he began selling stories to pulp magazines. When a fire gutted his apartment in the 1930s he used the insurance money to study at the Sorbonne for a year. After that he began writing histories. Wargamers know Pratt as the inventor of a set of rules for civilian naval wargaming before the Second World War. This was known as the "Naval War Game" and was based on a wargame developed by Fred T. Jane involving dozens of tiny wooden ships, built on a scale of one inch to 50 feet. These were spread over the floor of Pratt's apartment and their maneuvers were calculated via a complex mathematical formula. Noted author and artist Jack Coggins was a frequent participant in Pratt's Navy Game, and L. Sprague de Camp met him through his wargaming group. Pratt established the literary dining club known as the Trap Door Spiders in 1944. The name is a reference to the exclusive habits of the trapdoor spider, which when it enters its burrow pulls the hatch shut behind it. The club was later fictionalized as the Black Widowers in a series of mystery stories by Isaac Asimov. Pratt himself was fictionalized in one story, "To the Barest", as the Widowers’ founder, Ralph Ottur.